Ida Mae - It’s quite some transformation from their grunge-blues band Kill It Kid, but former members, and now husband and wife, Chris Turpin and Stephanie Jean are opening up a whole new musical world. The duo is now emerging from a period of self-discovery and mutual creative power to create the rawboned and stripped back musical romance that is, Ida Mae. Ida Mae’s magic lies in the sensuous dovetailing of two voices and the intimacy of their songs. Their chemistry on stage isn’t just a dramatic pose and is a truly captivating sight to behold. 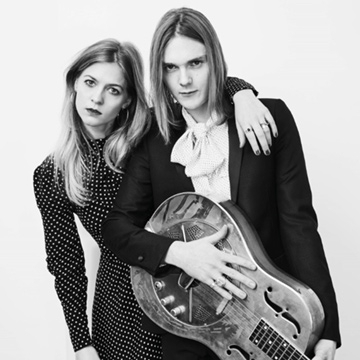 Chris' vocals are reminiscent of a Face’s era Rod Stewart or Steve Marriott, while Stephanie combines the delicacy of Patty Griffin with the effortless rock-chic of Alison Mosshart. Singing together, the couple have an unusual ‘which-is-which’ dynamic. Having recently moved from Holloway in London to Nashville, TN, recent highlights include touring with The Lone Bellow, Nick Mulvey, Nikki Lane and Will Varley. They have also been honoured to be selected to play Emmylou Harris's Woofstock Festival & Kings Of Leon's Harvest Night in Nashville.